The following is a guest post from Jenny Gravenson, a farrier in Minnesota. I first saw the Blacksmith Buddy at the Midwest Horse Fair in Madison, WI earlier this year. I had driven from Minnesota to participate in the World Championship Blacksmith’s competition. There are hundreds of retailers with booths at the Fair and you can waste plenty of time just looking around. Erin Baayen was one of the vendors under the big tent. The stand-alone artificial horse leg was hard to miss. There were tools and shoes around it, waiting to be used on the Blacksmith Buddy by interested farriers. Over the three-day weekend, I spoke with Erin several times and was impressed with her warm professionalism, interest and knowledge of the farrier craft. 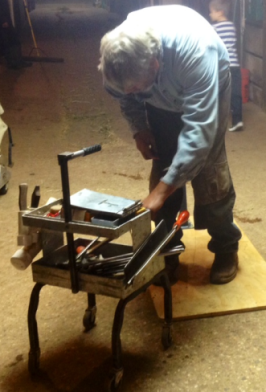 2013 was the beginning of the third year I’ve spent under the wing of a 40-year-veteran farrier. I began work with Keith Raleigh the spring after I attended class at the Minnesota School of Horseshoeing in Ramsey, MN. A classmate began work with Keith in the fall after we graduated, and he set me up to buy Keith’s used forge. We met for the first time at a little bar in a suburb east of the Twin Cities. I caught my finger in his bed-slide while helping push it in after the transaction. I’ve pushed it in hundreds of times since then and managed not to make that mistake twice. Keith is one those old solid workhorses you can always depend on however stiff or sore he might be feeling. He has serviced many clients for years, is active in many other branches of the horse industry, and most of his clients have become his good friends as well. He is available at any hour to discuss a horse’s condition, performance, shoeing prescriptions or how many ribbons little Jessie took home on Bubbles. This summer, in the middle of the Hunter/Jumper show season, Keith had several small strokes. It felt like Keith’s personal loss devastated a whole community. Mixed with the obvious concern for Keith’s personal health, every client faced uncertainty about his ability to return to work. On the flip side, Keith knew he would need to accept assistance from other farriers and assure his customers that only competent craftspeople would care for their horses in his absence. Keith has spoken of his gratitude to friends, coworkers, and other farriers in Illinois, Florida and Kentucky that gave their support. I think he lived with the phone glued to his head from his first missed day of work through three weeks into his return to the anvil. In this time several people worked overtime to help Keith’s horses shod and performing. I racked my brain, trying to think of any way Keith’s recovery might be quickened and strengthened, and in the chaos remembered the Blacksmith Buddy I’d seen in Madison. 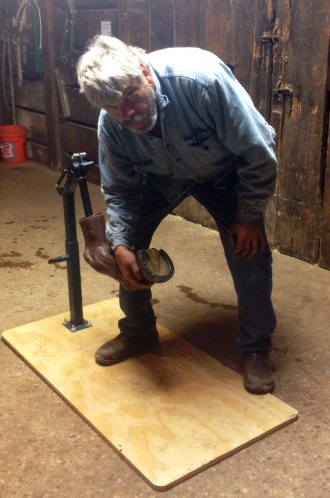 It was being used as a teaching tool in shoeing and veterinary schools, but I talked to Keith about the tool to gauge his interest in using it, and he played along. I called Erin; she listened to my story and idea, and passed it on to the company boss. I was thrilled when she called me back to tell me it was a go! Keith was regaining balance and strength, he opened the BB and began to work with it as soon as he could. While hadn’t lost his touch with a pair of nippers, he thought his knife work could improve through practice on the synthetic hooves. He could work on his balance without having to worry about the potential danger that goes along with being under live horses and he could stand under the leg, letting the tension gently build his strength in regular working positions. We agreed the material that composes the hooves is great. You can work on it with all your tools, in the same positions you would be in under the front legs of a horse. It gives you the opportunity to develop and to rebuild muscle strength and hand-eye coordination. You can fine-tune your sole paring and nipper runs, and analyze the way you rasp a hoof level. The shape of the detachable hooves calls for the student to build curves and straight lines into the shoe shape. You can practice pulling shoes and driving nails, and spend time working on efficiency and accuracy. All this you can do without worrying about another animal’s patience and your mistakes causing him harm. The Blacksmith Buddy has an intuitive design that makes using and adjusting it easy to do. It’s amazingly anatomically correct and if you really want to get down to basics, you can practice how you pick up a foot and place a hoof stand under it. You can look down the leg at balance, feel how a shoe fits on the hoof, and look at your trim and fit from every angle. You miss the rest of the horse being attached and giving you immediate feedback, but prospective students will get plenty of that experience soon enough in their careers. The BB offers a quiet, stable synthetic hoof to work on. It is a product that sets itself apart in the market with its innovation, accuracy and efficiency. Jenny works as a farrier in Minnesota. She has multiple continuing apprenticeships with experienced farriers. She is a member of several farrier organizations on local, national, and international levels. She enjoys participating in continued education opportunities such as clinics, competitions and certifications. 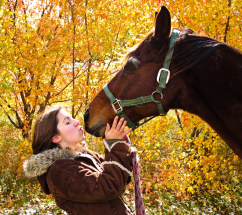 Jenny is available on Facebook and is pictured with her beloved horse Rocket.